We’re hosting a blood drive! 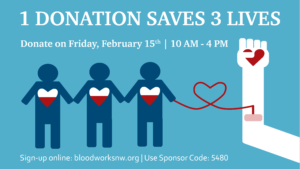 Bloodworks Northwest will be on site with their Bloodmobile accepting whole blood donations from 10 a.m. to 4 p.m. with a break from 12- 1 p.m. The Bloodmobile will be located outside of the main patient entrance in the SPMC parking lot. Sign up online at www.bloodworksnw.org/drives or call 1-800-398-7888 and reference sponsor code 5480.